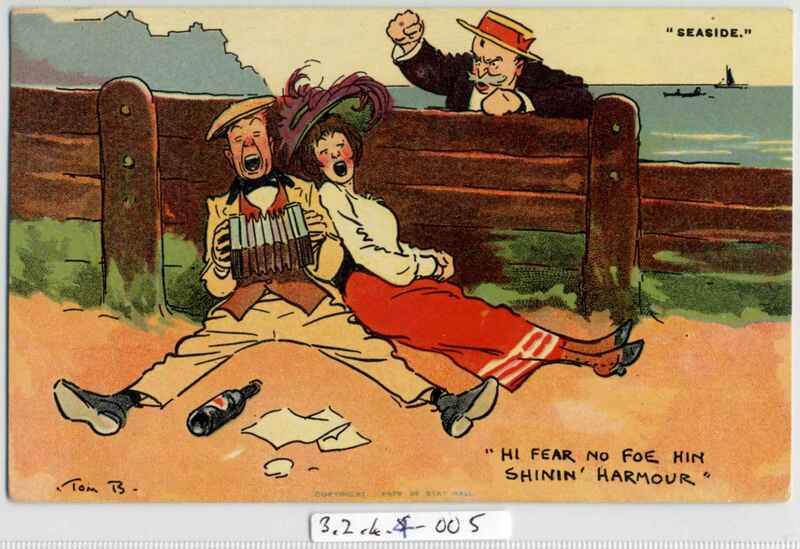 Full Description: A humorous postcard of a couple of singing holidaymakers (one plays an octagonal many-bellowed concertina) saying "Hi fear no foe hin shinin' harmour", while the irate "foe" shakes his fist at the noisy duo. Divided rear, message used but only faint stamp of 1907, Card by Davidson Bros Pictorial Post Cards, originals by Tom Browne, Serie 2586. See also Item NC:3.2.4.4-004 and NC:3.2.4.4-007 .